We went out to Calavie a while back to visit Mama Carole (actually Soeur Julianne, but over here you can call anyone by most any name. Since she is the mother of Carole, the girl who is on a mission, Soeur Julianne or Mama Carole work equally well). Her daughter Josianne is a cute girl about 13 or 14 years old who is growing up and filling out. When the member who was with us to translate saw Josianne she excitedly told her she was getting so fat. That comment didn’t set well with Soeur Black who argued that she was not fat but rather looking really good. The member wouldn’t back down and a pretty good argument ensued, which I quite enjoyed, about whether Josianne was fat or not. To understand the rest of the story, you need to know that in a culture where people do not always have enough to eat, to be fat is a considerable compliment and simply means that you are growing and looking good. So it turns out that the member was actually trying to pay her a compliment and Soeur Black was adamant that she didn’t deserve the compliment. Now that she understands that, Soeur Black is thinking she may want to stay in Africa. We will see if that happens!! This has been a wild and interesting week. President and Sister Harmon from the Ghana Missionary Training Center wrote us a couple of months ago and suggested they would like to come over in July and give some firesides on missionary preparation. We got it all arranged for one in Cotonou on Tuesday, July 21 and one in Lome on Thursday, July 23rd. On Tuesday they came over and spent the night with us after the fireside. About 30 people attended in Cotonou and it turned out really well. President Harmon and I were both missionaries in France a lot of years ago and have kept in touch a little since. Some of you may remember that he is the doctor that treated Dad (Frost) when he had prostate cancer. Soeur Harmon and Soeur Black seemed to have a lot in common, both enjoying cooking, sewing, shopping, and a lot of other such “women” things. Basically this is the first contact we have had with any couples from our culture since the Gillis’ left in January so it was greatly enjoyed. They stayed in Cotonou with us on Tuesday and we had planned to come to Lome on Wednesday but we got so busy showing them around that we decided to postpone our trip until Thursday morning. We stopped in Ouidah and visited a slave castle, a python temple, and the beach and then headed onto Lome. The Lome fireside was attended by about 60 or so. 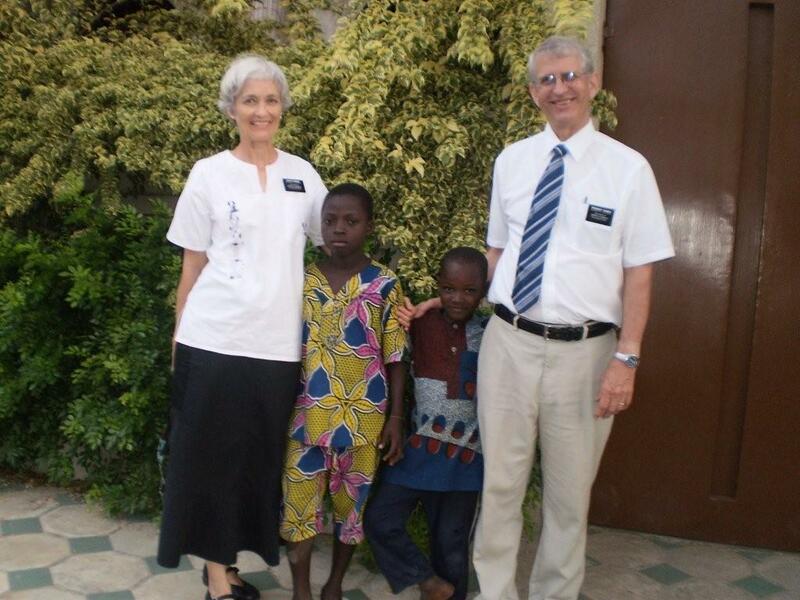 On Friday, we took President and Sister Harmon to the border to cross, in company with President Blaise who rode to Accra with them in order to be there to pick up Marlene and the boys on Saturday. How good it was to see them when we picked them up at the border where we had left the others the day before. With all the activities with Marlene, Jared and Aaron (for those who may not know, Marlene is our daughter-in-law and Jared and Aaron our grandsons) we will have plenty of pictures next week. The other part of this last week is that the Internet has been down more than it has been up. Between that and traveling, this installment is late. Hopefully we can still get it sent even though it is time to start another.